In this week’s bulletin, Phillipines flood relief, saving Toronto Community Housing run by the St. Vincent de Paul society, and a Mosaic Interfaith meeting. 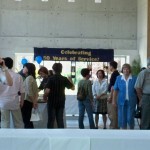 The 2012 Offertory Boxed Envelopes are now available in the Gathering Space. If you are not currently using parish envelopes and wish to have a set issued for next year, please contact the Parish Office. This is the most effective way to keep track of your donations. If you have recently changed your address or phone number, it would be helpful if you would let us know at this time. Thank you to the volunteers who prepared 54 casseroles for December. For January, your prepared casseroles (frozen please) will be collected at the Masses on the weekend of January 28th /29th, 2012 for delivery to the Good Shepherd Centre. ST. VINCENT de PAUL – WE NEED YOUR HELP! In plans for cost-cutting, Toronto City Council is considering selling properties that they own. Eleven of these houses are run by the St. Vincent de Paul Society. These homes and programs provide for recovering alcohol and drug addictive people. Selling them will mean that these programs will end. There are 86 beds and over 7000 people have been served over the years. The great majority have met with success. St. Vincent de Paul is asking for an exemption for these homes from a proposed TCHC sale. So far, they have been met with vague official prevarication. Please contact the Councillors in Wards 13, 17, 18, 19, 28, 30, 32 and the councillors for Willowdale, John Filion and David Shiner, and convince them of the absolute need to retain these homes for the continuation of their present invaluable use. Voting will occur in the next two weeks. 416 218 0680. See notice on bulletin board. Please mark your calendar! 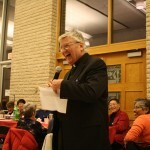 The Multicultural Potluck Dinner is now scheduled for January 29, 2012 (Sunday). With multicultural food and “fun” events, it will be a wonderful expression of the diversity of our parish. This will be an excellent opportunity for those who participate to not only enjoy great food from all over the world but also to mingle and get to know one another. Tickets (at $5 each) will be available after all the Masses on the weekends of January 7/8 and 14/15. 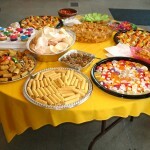 You will receive more detailed information about the potluck arrangements then. Seats are limited, so please make sure that you book yours early! Come and join us in prayer with His Grace Archbishop Thomas Collins, joined by His Grace Anglican Archbishop Colin Johnson, Lutheran Bishop Michael Pryse, Slovak Catholic Bishop John Pazak, Assyrian Catholic Bishop Emmanuel Mar Emmanuel and other city-wide religious leaders on Sunday, January 22nd at 3:00 PM at St. Michael’s Cathedral. What role should religion play in formulating public policy in a secular state? The Sneak Peek Orchestra is at it again. After a sold-out chamber concert in the fall, the SPO is pleased to present its major concert of the 2011/12 season, Dreams of Flying. On February 4th,, 2012 at 7:30 PM, this imaginative and visionary presentation will take audiences on a breathless trip through orchestral pieces new and old. Toronto composer Rob Teehan’s Juno-nominated Dreams of Flying will open the concert, followed by Kevin Lau’s newest creation, Foundation. Dazzling soloist Rachel Mercer will perform this cello concerto. Finally, return to earth but let your spirit soar with Ludwig von Beethoven’s epic masterpiece, Symphony No. 7 in A major. The concert will take place here at St. Gabriel’s Church. Tickets are $20 general admission, $10 students. Check out www.sneakpeekorchestra.com for more information. 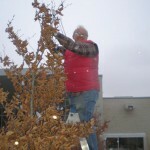 This Bulletin entry was posted on Sunday, January 8th, 2012.